SEOUL, July 26 (Yonhap) — More than half of South Koreans traveling abroad take local food, such as instant noodles and condiments, with them, a poll showed Thursday. 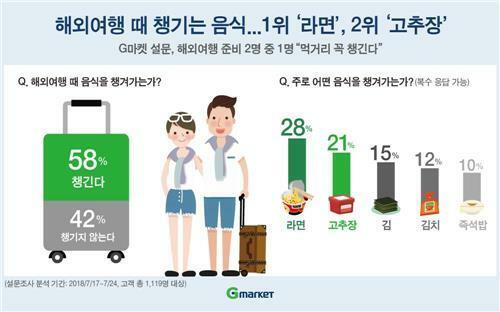 According to the poll conducted by major online shopping mall Gmarket on 1,119 people, 58 percent of the respondents said they purchased Korean food to supplement what they eat when traveling in foreign countries. The poll showed 33 percent of the respondents said they are not overly fond of foreign food, followed by 30 percent saying they pack Korean food for their traveling companions. Twenty-eight percent of the respondents said they took instant noodles, followed by “gochujang,” or hot chili paste, with 21 percent. The poll showed 15 percent of travelers took dried and seasoned laver, with 12 percent opting to pack the spicy fermented side dish kimchi.